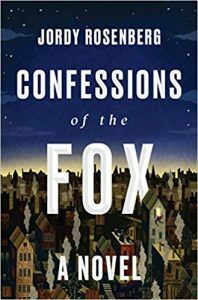 Jordy Rosenberg’s Confessions of the Fox lives in that liminal space between fantasy and straight-up fiction. Many have taken to labeling the novels that live here “inter­stitial” – and the whys of that term are best discussed in another column or, better yet, at a bar. If you’ll allow it, let’s take it as read that Rosenberg’s meta retelling of the legend of 18th century thieves Jack Sheppard and Edgeworth Bess (whose story was most memorably told in Brecht’s Threepenny Opera) lives in the inter­stitial Venn overlap between fiction and fantasy. Confessions of the Fox is a hard book to summarize. 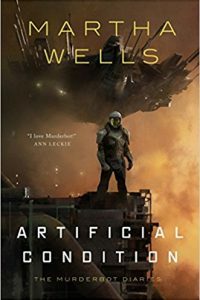 One part is about a modern-day scholar, Dr. Voth, who finds an undiscovered manuscript about Jack and Bess at a university book sale. Voth – self-described as “a guy by design, not birth” – annotates the text and un­spools a sly, occasionally laugh-out-loud story about identity, gender, and love – and, cuttingly, the nature of scholarship. The other part is Jack and Bess’s own story, as they scamper through London’s smelliest underbellies. Each is isolated in his or her own way. Bess is a woman of color; Jack, like Voth (and Rosenberg) is transgender. You can see how it can get pretty meta pretty quickly – and that’s where the book’s magic exists. 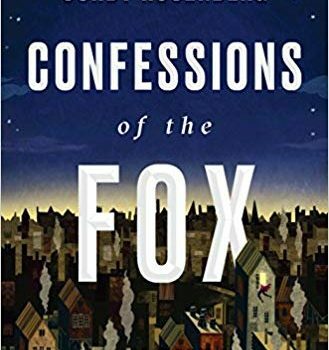 Confessions of the Fox sounds like it could be a dry dissertation on philosophy and economic justice, especially once Spinoza is casually mentioned, but, instead, it is wry and lewd and fun. Rosenberg explodes narrative expectations repeatedly while never forgetting to make us care about the characters. And the end, as the kids say, is a kick right in the feels.